My summer vacation seems to have taken a bit of a turn. I had every intention of relaxing and using my free time to get organized for the upcoming school year and perhaps even plan my wedding (July 26, 2013!!!). However, an opportunity to work with the early intervention and preschool population arose that I could not pass up. After spending a year with my middle schoolers I definitely needed to jog my memory and re-familiarize myself with functional and multipurpose toys to use in order to support and develop language. I am using this post to do just that. Here is a compilation of some of the things I’ve have found useful in the past, as well as toys I would like to utilize moving forward. Kids can't seem to get enough of this game, although adults get tired of this one fast! This is a classic game where an elephant blows butterflies out of his trunk and are caught with nets. Short utterances can be modeled (e.g. “Pick up,” “Ready, set go!” etc.) as well as requesting, and turn-taking behavior. Important spatial concepts regarding spatial relationship (e.g. front, behind, top), quantity, colors, directions, etc. can also be addressed. This toy allows you to target color matching, prepositions (e.g. in/out, up/down), requesting, turn-taking, cause/effect etc. Just me mindful of fingers during this activity as children tend to get very excited and occasionally “miss” their target. Bubbles are one of my favorite therapy tools because they can be used to assess language skills as well as promote its development. Skills such as eye contact, requesting, signing, sound production, word/phrase production, turn-taking, quantity, etc. can all be addressed. 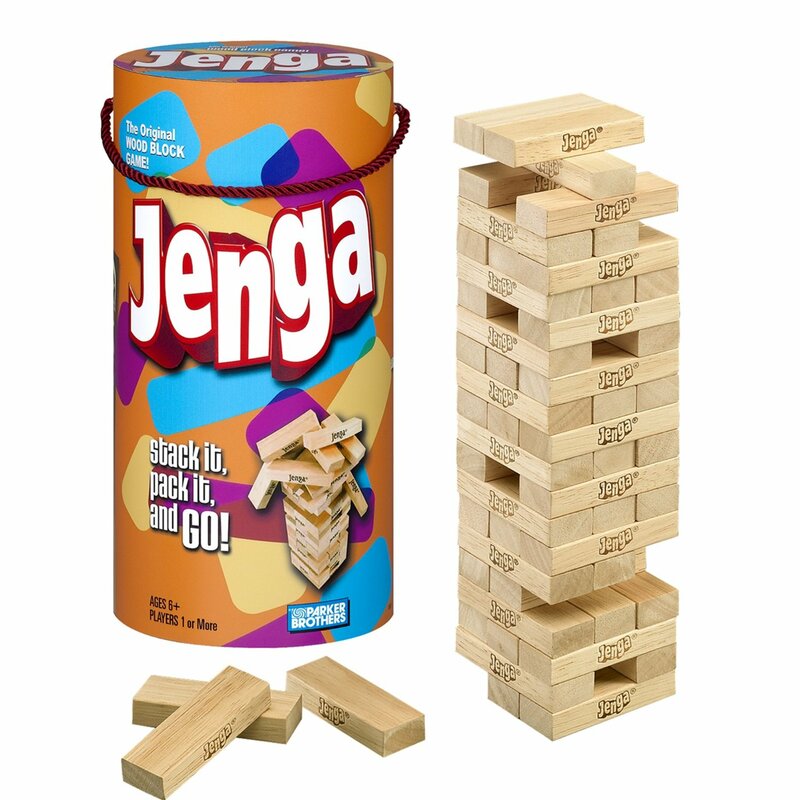 Classic Jenga with an updated look. 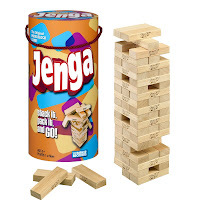 Jenga is a classic no frills game that is a tried and true motivator. It reinforces turn-taking behavior and spruces up any speech/language activity. After producing a target sound, answering a question etc. have the student take a turn removing a block. I have also found this to be a great demonstration of concepts like “gentle”, “slow”, “rough”, “careful”, etc. In addition to requesting and turn-taking, many concepts can be targeted with a shape sorter. Concepts include: prepositions ("in", "out", "on"), color, shapes, directions, full/empty (depending on type of sorter), quantity, etc. Blocks are an essential part of any SLP’s toolkit as they encourage creativity as well as target prepositions, spatial relationships, directions, quantity, cause/effect, as well as social skills related to turn-taking, and sharing. These are only a few examples of toys to utilize with the preschool population. I am fully aware that there are a plethora more available. However, I find that the simple toys/games/activities illicit the most language, as there are no bells and whistles to distract the child from their innate need to play. Lovely blog very informative im going to try the elefun game i believe my daughter will really love that game thanks Ms. Sohan!!! Great! I'd love to hear how she responded to the game. Great blog! Stopping by from SITS! Your blog is very informative and cute! If I could do undergrad over again, I would go into speech/language. I think that it is such an interesting field with so many areas in which you can work. I can't wait to read more on your site!